Our family is a whole turkey kind of family. We like our white meat and we like our dark meat. I know other out there would just like to stick with the white meat, so they opt for a turkey breast. In order not to exclude those blog readers who are white meat only and to take advantage of a sale, I picked up a couple frozen turkey breasts. I wanted to try a couple recipes off of Food Network’s website. 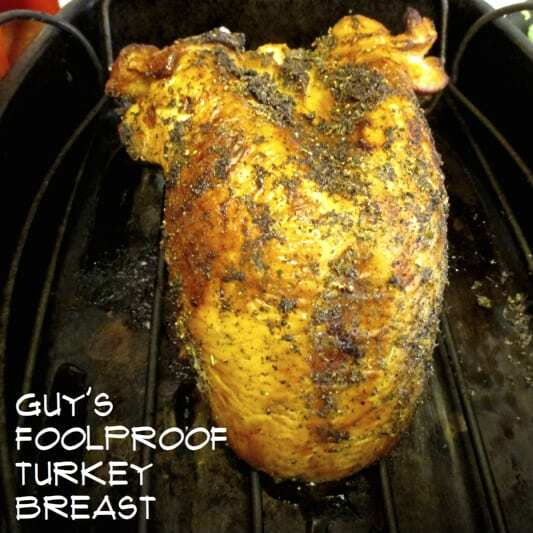 Guy Fieri’s Foolproof Turkey Breast was one of the ones I wanted to give a go. It’s a bold statement to call anything foolproof. But what can I say Guy Fieri is a bold guy (sorry I could not stop myself with the bad pun…expect more of them!) What make this recipe unique, at least for this guy (me, not Mr. Fieri) is that is includes both a brine and a rub. This is also the first brine I have done that uses molasses. For the recipe, visit Food Network’s website. Here are my notes from preparing this turkey breast. 1. The recipe calls for a whole turkey and for you or your butcher to remove the legs and wings. Of course you could just start with a bone-in turkey breast as I did. If a whole turkey is cheaper than why not. You will have the wings and legs for later use. 2. I used all the ingredients as he said, except I was out of onion powder. The sage I used from my garden. It had already been dried. I then just rubbed the leaves in a strainer. 3. I realize the brine was going to be more than I need to completely submerge the turkey. So I pour it out of the pot once it had completely cooled. I added the turkey breast and then poured enough brine to cover it. I place the rest of the brine in a plastic bag and placed it in the freezer to use for the next time I want to brine some poultry. 4. Guy calls for the turkey to be in it’s brine for 12 hours. This is where you have to time it right, so you also have to allow the rub to sit on the turkey for 4 hours – for a total of 16 hours inactive time. If you want your turkey ready to go in the oven at 3pm, then you need to start the soak at 11pm, the previous day. Don’t feel stuck to these times. If you need to shorten the time, you can do so by a little, and I don’t think it will make a huge difference. I end up going a little short of the 4 hours for the rub to sit. 5. Guy starts the turkey off at high temperature to brown it and then lower it for evening cooking. He says to flip it over after roasting at 425. I did not think that was necessary. If the breast starts to get too brown you can always tent it with foil. I did not like the idea of trying to flip that thing mid-cooking. Mine turns out perfectly fine, didn’t even need to tent it. 6. Guy says to check the temperature with an instant read thermometer. I used a probe. It just goes right in the bird and you just wait until you hit the right temperature. Then you don’t have to keep opening the door up, losing heat, and making the turkey take longer to cook. The turkey breast came out moist and flavorful. The brine added flavor to the interior of the meat. The rub didn’t bring as much flavor punch as I would have liked. Next time I would put it directly on the meat, not the skin, since we don’t really eat the skin in our family, but if you do, by all means follow Guy’s instructions. One thing I will tell you it was a lot easier to brine a turkey breast than it is to brine a whole turkey!